Our product range includes a wide range of voltage converter and ac voltage converter. 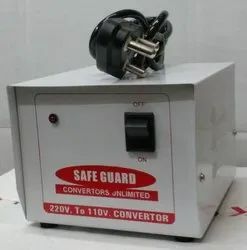 Owing to the finest raw materials and modern machinery used in its making, the offered Voltage Converter has a high preference in the market. For standardization of quality, we abide by the set industrial norms and guidelines. The offered product is known for the commendable functionality it provides, its superior lifespan and unmatched sturdiness. 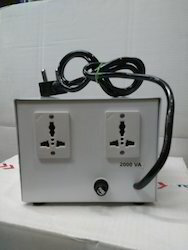 Features: Commendable functionality Superior lifespan Unmatched sturdiness Specifications: Voltage converters and voltage transformers are available in different wattage combinations: converters are available from 50 to 10000 wattsTransformers are available from 1 to 100 watts, 200 watts, 300 watts and strongerYour transformer will either step up and down the power (change 110 / 240 volt electricity into 240 / 110 volts) or step it down (change 220 volts to 110 volts) so you can safely run your appliance. The prices depend on capacity, quantity of the products. Special prices for dealers and bulk purchasers. Manufactured as per the set industrial norms and guidelines, quality of this AC Voltage Converter never deteriorates. The offered product is manufactured using the finest raw materials and modern machines. Owing to this, the offered range provides highly commendable functionality and has a superior lifespan. In addition, the offered product is marked at the best rate possible. Voltage converters and voltage transformers are the same concept: They will turn the power of 110 volts into 220 volts, or 220 volts into 110 volts. They come in plain model as well as with builtin stabilizer & high voltage cutoff models. A servo model where the out put voltage will be constant at 110 volts +/- 1% can also be made against order. output 100 volts, specific to JAPANESE equipments can also be custom made.